As a flower of the field, so Anthos flourishes. 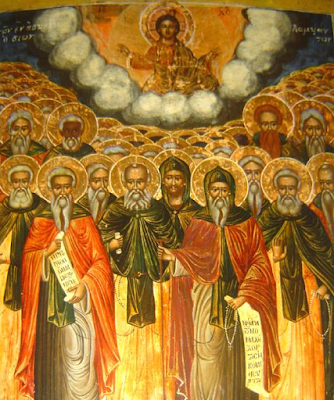 When Saint Savvas the Sanctified was living in asceticism in the desert of Rouba, there came to him and stayed with him a monk named Anthos, who had lived with Saint Theodosios in the Church of the Cathisma. While they were living in this desert, they were set upon by Saracens, six in number, barbarous in character and mischievous in intent. Incited by malice, one of their number was sent to presumably attack both monks and take them prisoner if they resisted this single man. On seeing their plight, the blessed fathers in no way yielded to panic, but ascending to God with the eye of the soul, they prayed earnestly to be delivered from the plot of these wicked barbarians. Instantly the earth opened and swallowed the barbarian intending to test them, at which the rest, on seeing the terrifying miracle, fled panic-stricken. From then on our father Savvas received the divine grace of never being in fear of barbarian plots; and this was the first time that our father Savvas, through living with blessed Anthos, became known to the blessed Abba Theodosios, before the foundation of his holy and celebrated monastery. Our Venerable Father Anthos reposed in peace.